Part of a mini-suite. For 7, 8.1 and 10. 2 version. With and without user frame. Rollup button included. Wallpaper and user pic are in the zip. This is a very nice, clean skin, Ross! Very useable for everyday computing! Excellent-looking wb. Clean and sleek design. Thank you for sharing! Really nice job Russ nice choice of colors & yes it just really worked out well really like it thanks for sharing & please keep them coming You Make Good Skins we like. Beautiful skin and suite!! Thanks very much!! Looooove this so easy on the eyes !!!!! I wish more people took time to give unique looks to all the controls. It looks nice. This is very good skin. 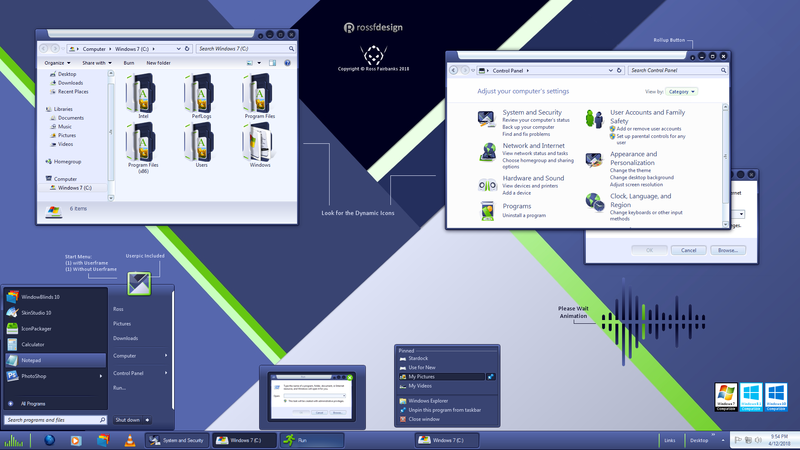 However, unlike the Cascade one you did (also very nice), I noticed that the date and time don't align well on my other two monitors. Not sure if that has to do with the settings for resolution, scale etc. I have no idea how to even modify these blinds. I just enjoy your work.